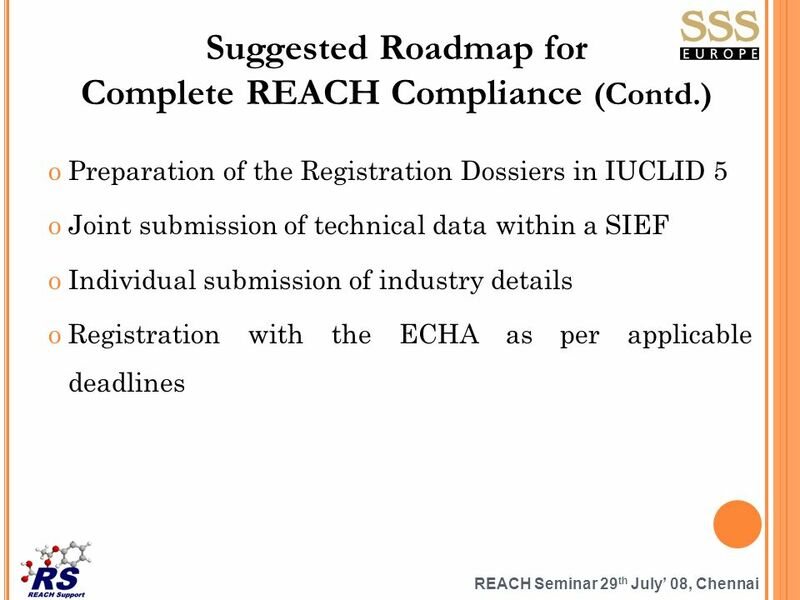 15 REACH Seminar 29 th July 08, Chennai Issue of the Non-EU Traders Options available 1. 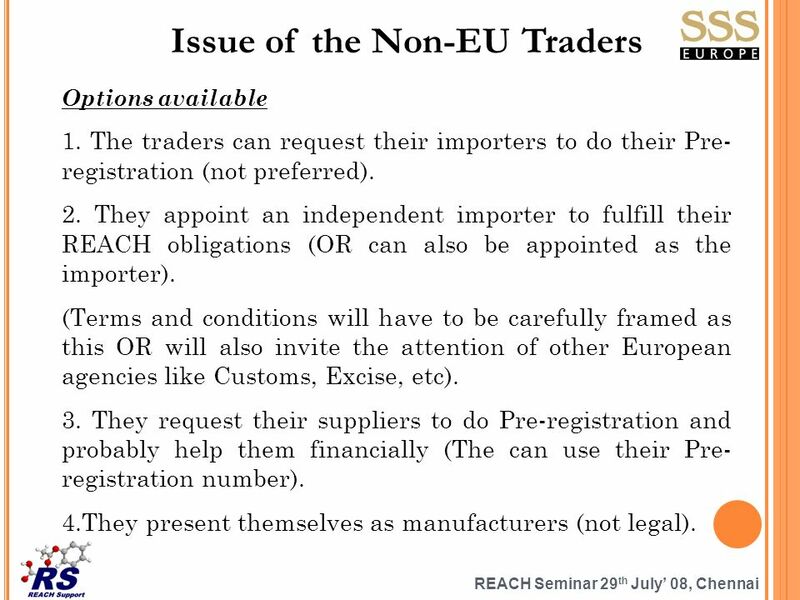 The traders can request their importers to do their Pre- registration (not preferred). 2. 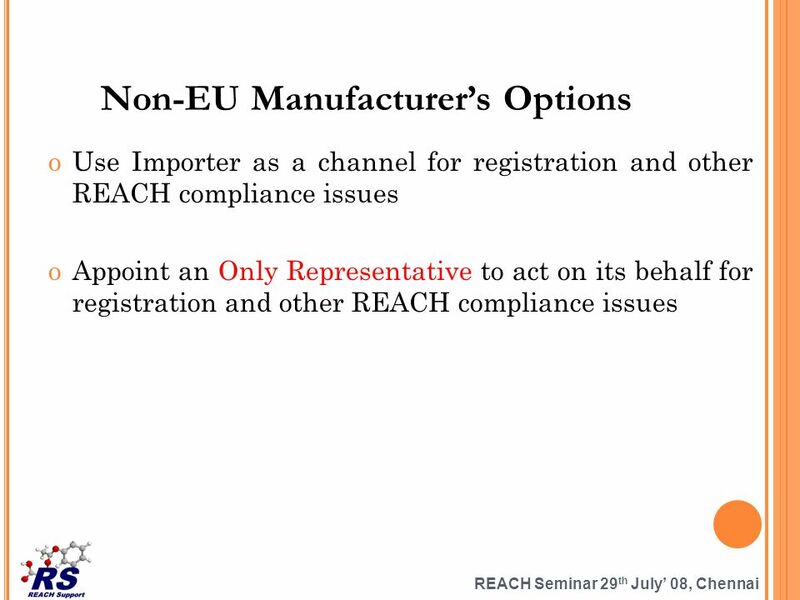 They appoint an independent importer to fulfill their REACH obligations (OR can also be appointed as the importer). 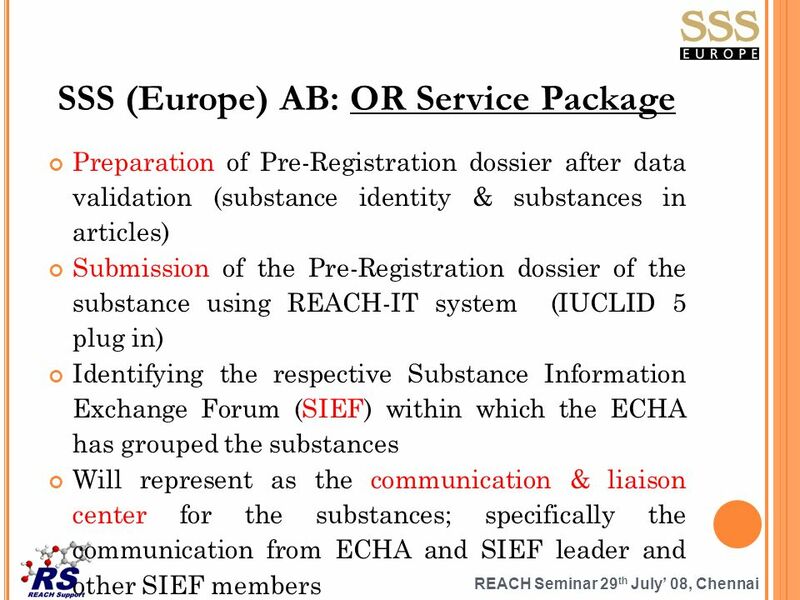 (Terms and conditions will have to be carefully framed as this OR will also invite the attention of other European agencies like Customs, Excise, etc). 3. 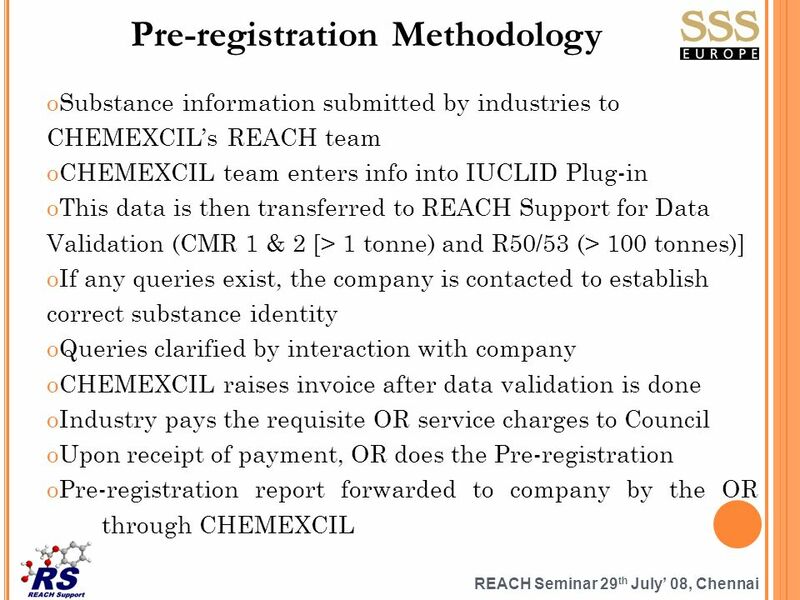 They request their suppliers to do Pre-registration and probably help them financially (The can use their Pre- registration number). 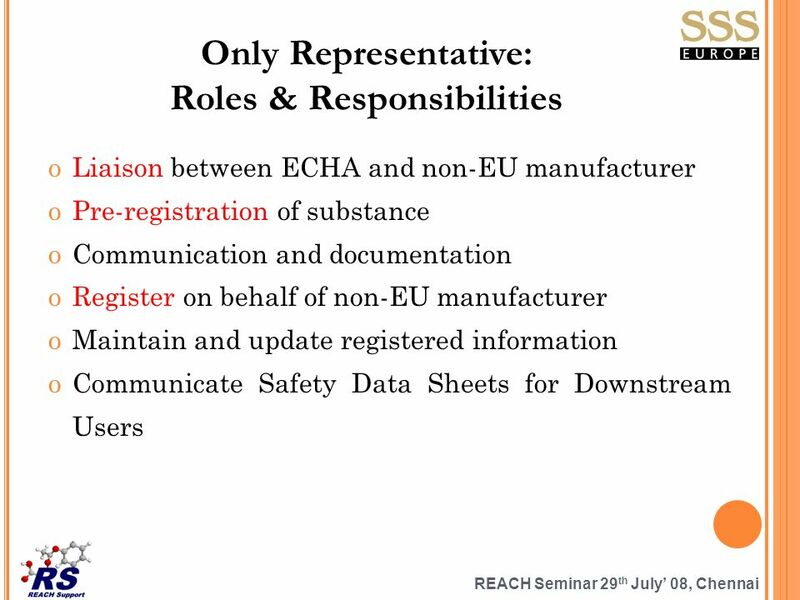 4.They present themselves as manufacturers (not legal). 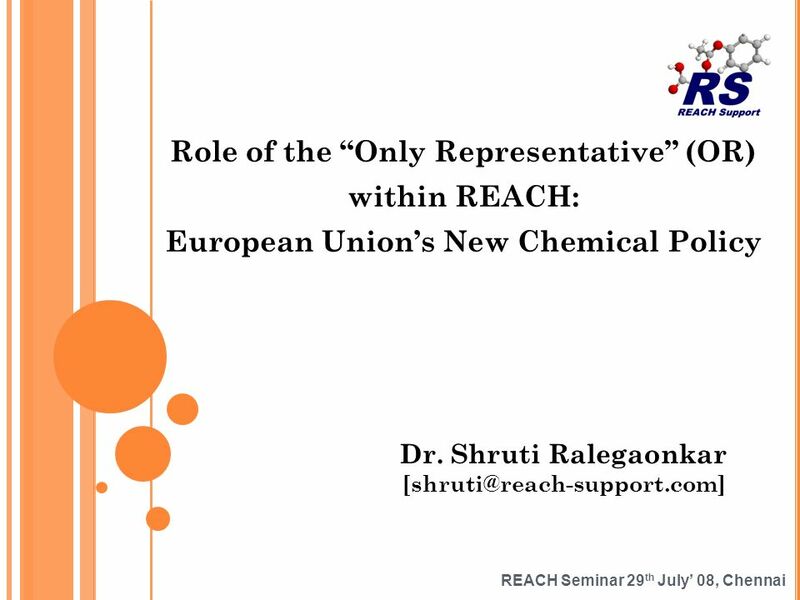 Download ppt "REACH Seminar 29 th July 08, Chennai Role of the Only Representative (OR) within REACH: European Unions New Chemical Policy Dr. Shruti Ralegaonkar"
REACH COMPLIANCE COMPLIANCE OF REACH RELATED ACTIVITIES FOR MANUFACTURER- EXPORTERS OF CHEMICALS TO EU WITH CHEMEXCIL AS A NODAL AGENCY FOR REACH PRE-REGISTRATION. APEC Conference Cuzco, Peru August 11, 2008 V.M. 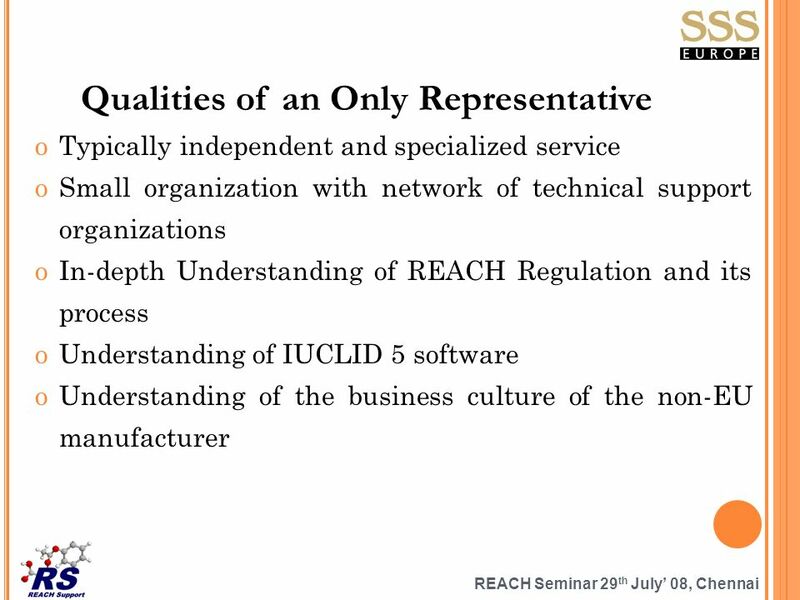 (Jim) DeLisi, Chairman SOCMAs International Trade Committee US Industries Experiences with REACh APEC. UNION OF HELLENIC CHAMBERS OF COMMERCE (UHCC). BRIEF BACKGROUND OF THE CHAMBER INSTITUTION IN GREECE The UHCC and the 59 Greek Chambers are Public Law. 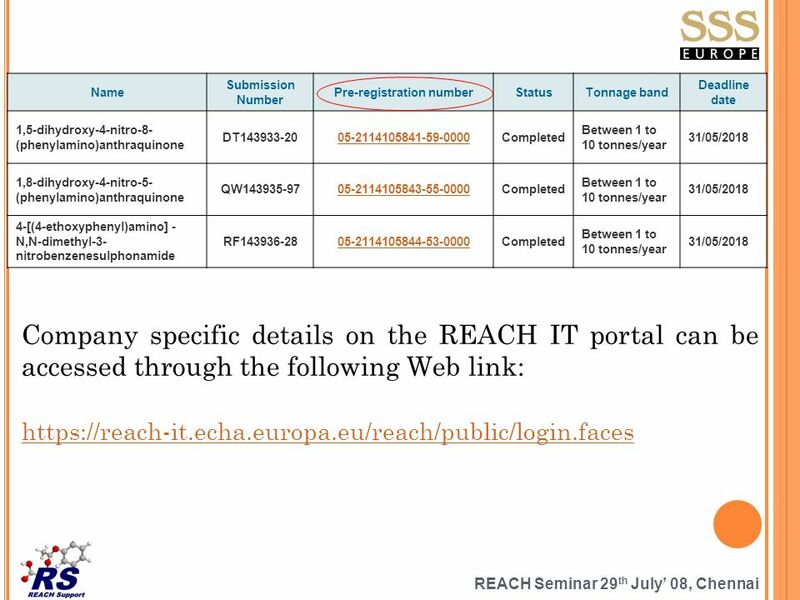 Echa.europa.eu/2013 ECHA Key Messages for REACH Engage actively in SIEF 2.Get used to the IT tools 3.Use the support tools before submitting your. Workshop on the harmonisation of information for Poison Centers, CLP Art November 2010 Niek Wetser. 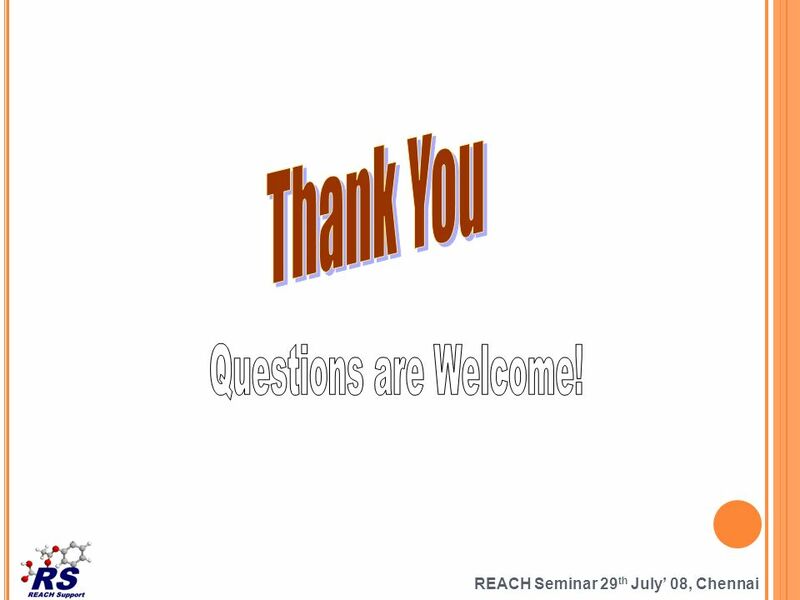 Klicken Sie, um das Titelformat zu bearbeiten TÜV Product Service Ltd © Open Day 24 June 2010 Phil Dolling REACh: What is it and how does it affect you? 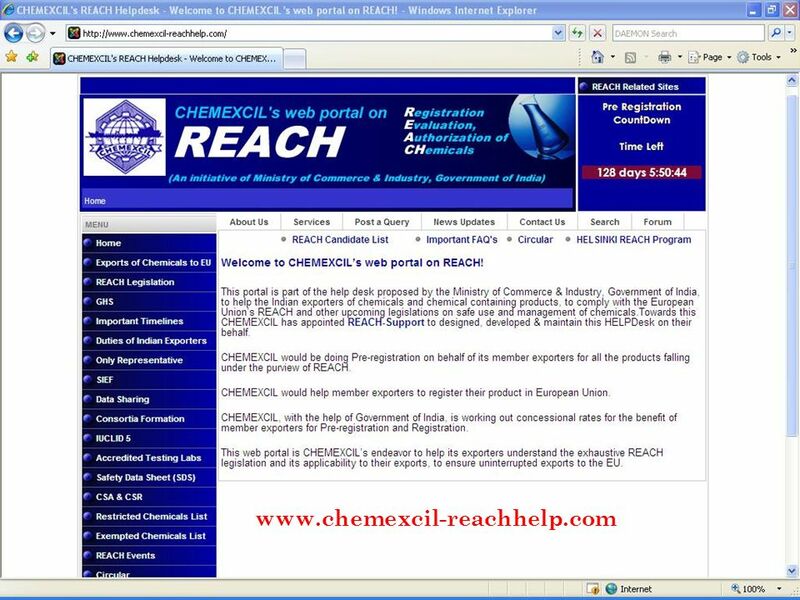 UIC – 29 & 30 May 2006 REACH Registration, Evaluation and Authorisation of Chemicals View of the French Chemical Industry Jean PELIN Union des Industries. Post Pre-Registration Christel Musset Directorate Registration & IT tools SIEF Management Brussels, 30 January 2009. Republic of Turkey Prime Ministry e-Turkey Working Group Nurcan ÖZYAZICI Nurcan ÖZYAZICI e-Document Implementing Group Coordinator Head of Data Processing. Interactions between IED and REACH Exploring the opportunities for cooperation Valletta, Malta October 2013 Geert Dancet Executive Director Conference. 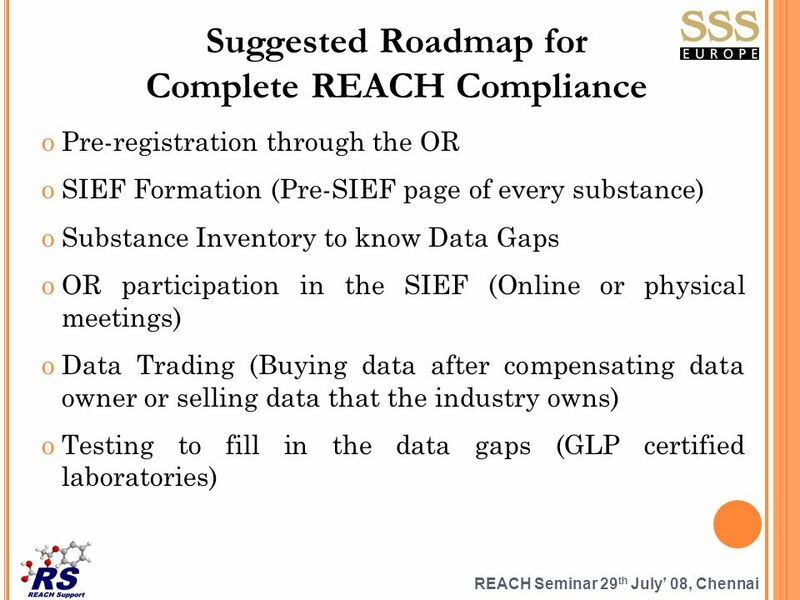 Chemicals Inventory Management as a Tool to Check Compliance with Restricted Substances Regulations Ursula Schumacher. 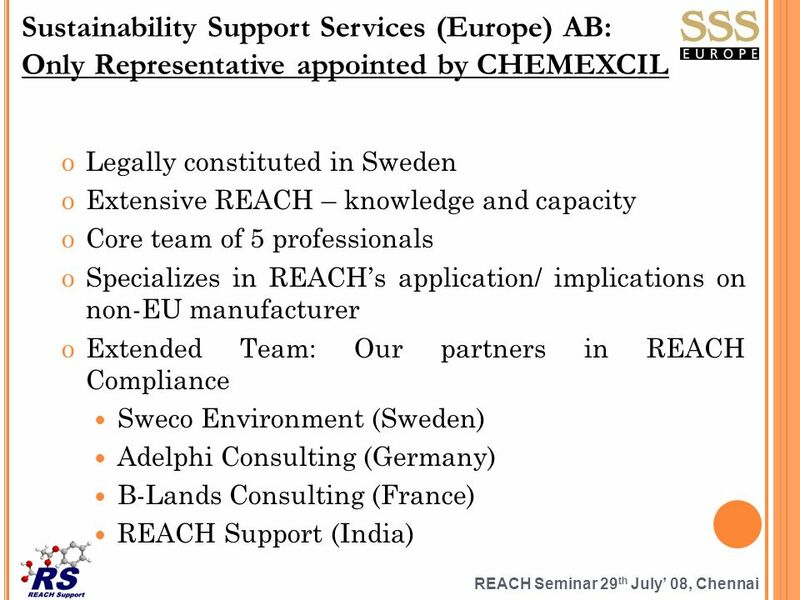 Toxics Use Reduction Institute Chemicals Policy in Europe: New Directions Rachel Massey Policy Analyst April 2006. 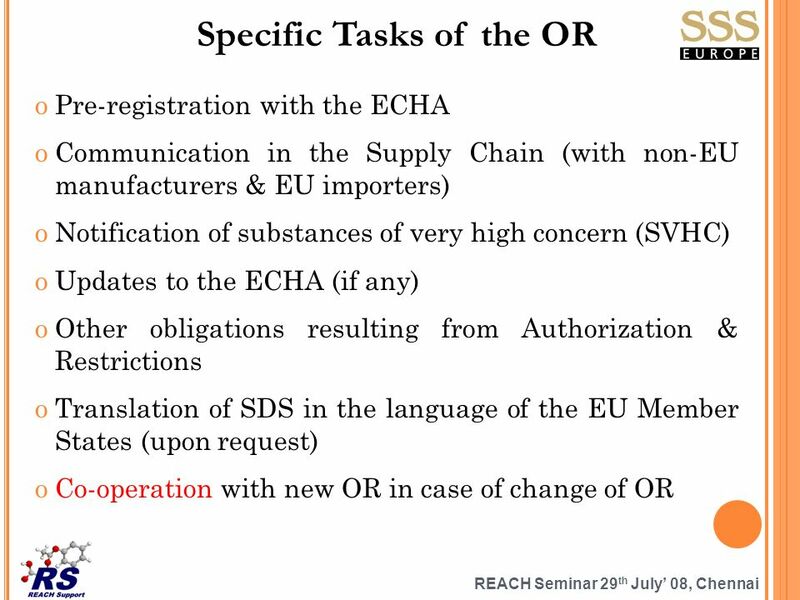 The impacts of EU Legislation REACH on Textile & Clothing Industries ITKIB Seminar – 28 October 2008, Istanbul Otto Linher – REACH unit This presentation. 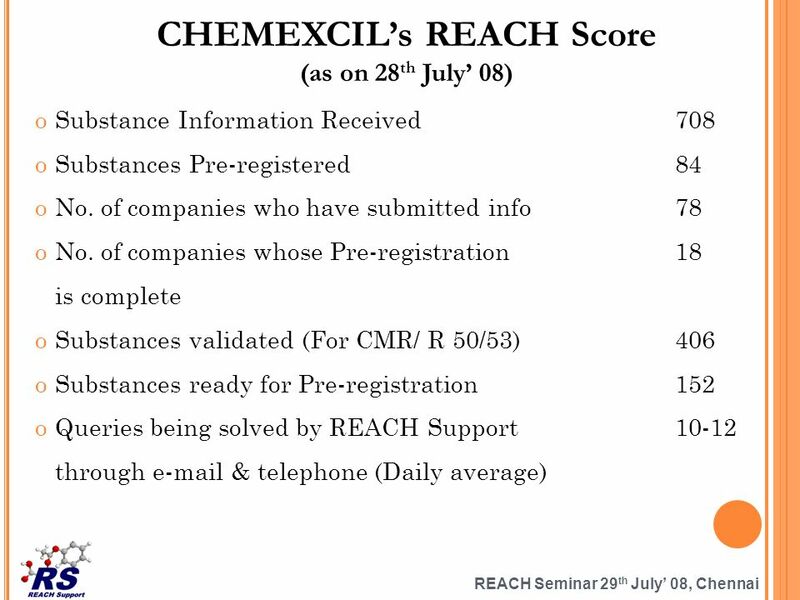 Investment banks: where do you fit into the REACH equation? 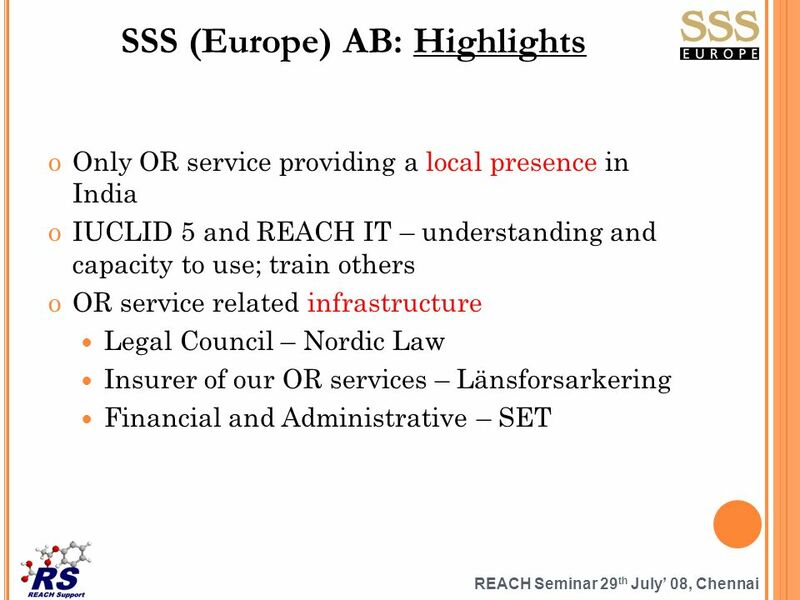 Breakfast seminar - 17 September 2008 CO-# v1-Banking_briefing.PPT.